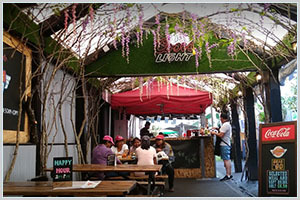 Vauxhall Street Food Garden | Pub Quizzers | Find a pub quiz near you, now. Pub quizzes take place at Vauxhall Street Food Garden, Vauxhall on Tuesdays (weekly) at 19:00. Entry is £2.00, you can have up to 10 people on a team. There are prizes of spot prizes, drinks. Happy quizzing! This venue is now on a break but there's another great quiz close by at the GRIFFIN BELLE, VAUXHALL 8 WYVIL ROAD | SW8 2TH. More details on the link.